The cost of ill health to the UK economy is around £100 billion a year. This is equivalent to running another NHS. ‘Presentee-ism’ costs (being at work but not really working) are estimated to be twice the number of absent days lost from the business bottom line. So how is it best to measure and inspire positive performance and loyalty in your people? NEF Consulting has developed a range of approaches to address wellbeing in the workplace, drawing on a decade of research into wellbeing by the New Economics Foundation. The research, published in the Government Foresight Mental Capital & Wellbeing report is incorporated in NICE guidelines, is aligned to the HSE standards, and is approved by the Centre of Applied Positive Psychology (CAPP). In 2014 NEF Consulting commissioned the New Economics Foundation to produce a review of the literature, Wellbeing at Work: a review of the literature. For more information and to download the report, click here. How much could investment in employee wellbeing benefit your organisation? By investing in employee wellbeing – their experience at work – organisations can improve their performance. Even when being conservative with our estimates, the savings associated with fewer sick days, greater staff retention and improved output quickly add up. Contact us if you would like to discuss how to map wellbeing improvements to sustainable business performance and corporate social responsibility objectives, capturing the wider social return on your investment. Instant results for real-time feedback. A simple interface presenting results in traffic light colours. National benchmarks automatically built into the questions, providing individuals, teams and organisations with an anchor point to understand and compare scores. Tailored results-based advice to mobilise collective ownership, skills transfer and action. Whether you want to improve health, education or employment, measuring wellbeing can show you the wider impact you have on the people and communities you support. This guide was developed by the What Works Centre for Wellbeing, New Economics Foundation and the Centre for Local Economic Strategies. It brings together the most important things that organisations working with communities and individuals should understand in order to measure subjective wellbeing. Show others the difference you make to people’s lives. Find out what really matters to the people you support. Improve what you do and grow your impact. The guide is available online on the What Works Centre for Wellbeing website. You can compare your wellbeing scores using the comparison spreadsheets which can be downloaded for free. The SWEMWBS wellbeing data comparator tool will allow you to identify how your scores compare against the UK national average for SWEMWBS. The APS well-being data comparator tool will compare your results from the four ONS subjective wellbeing questions to national data from the Annual Population Survey. Please note that the links to the tools are to Excel downloads not website pages. Our tools and processes are based on over ten years of research into measuring happiness and wellbeing by the New Economics Foundation. Here we outline some of the thoughts and ideas that have informed the development of our Wellbeing at Work services and survey tools. The dynamic nature of wellbeing means that there are many routes into improving it. 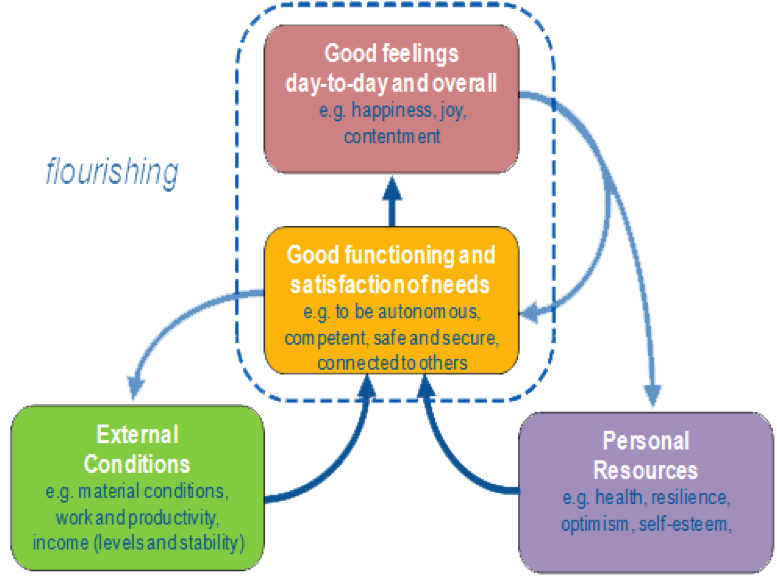 The trick is finding the mechanisms that become self-perpetuating, leading to positive outcomes for individuals and organisational performance.The model behind our understanding of wellbeing at work is based on NEF’s work with the UK Government Office of Science’s Foresight Programme. For the project report, NEF developed a measurement framework that integrated different academic approaches to understanding wellbeing in one coherent model. The model describes how an individual’s external conditions (bottom left) – such as their income, employment status, housing and social context – act together with their personal resources (bottom right) – such as their health, resilience and optimism – to allow them to function well (middle) in their interactions with the world and, therefore, experience positive emotions (top). The model shows how different aspects of our wellbeing interlink and how improvements in one area influence other parts of an individual’s experience. For the happiness at work survey we applied this thinking to a work context, creating indicators that describe how the organisational system interacts with the resources employees bring to work to support people to do well and feel good in their jobs. We believe that through better understanding these connections, individuals and organisations can identify the changes that will have the biggest impact – both for employee happiness and business success. These virtuous cycles explain why even modest improvements in wellbeing translate into good savings on the business bottom line. The dynamic nature of wellbeing means that there are many routes into improving it, which can lead to win-win situations, supporting higher wellbeing for employees and improved performance for organisations. What does a virtuous cycle in workplace wellbeing look like? Some we intuitively know from experience – think about a time when a highly energised and positive employee has lifted a room or boosted morale. The research shows that both happiness and cooperation are contagious. Other virtuous cycles have slightly more complex trajectories and very different starting places. Think about the employee who has a job well suited to their strengths. The more they feel they are doing what they do best at work, the more confident and useful they feel in their role. This makes them more able to connect their job to the organisation’s objectives, think round problems and be more pro-active. This ultimately makes them better at what they do. In turn, this makes them feel even more able and good about themselves. Organisational performance flows out the side of this process. Improvements in how an employee functions as a result of good job design translates into a happier employee, greater expertise and a real commitment. Of course, peak performances ultimately deliver results for the service or business. The starting place is in understanding how to improve the employee’s wellbeing at work. The next step is being intentional about acting on it. …making us more open to new ideas, more trusting of others, more creative and adaptable, and more flexible. …making us more confident in our abilities, more emotionally aware, more able to cope, and more able to bounce back. Undo the effect of negative emotions and buffer against stress. The New Economics Foundation’s report, National Accounts of Wellbeing, presents a radical, robust proposal to guide the direction of modern societies and the lives of people who live in them. It demonstrates why national governments should directly measure people’s subjective well-being: their experiences, feelings and perceptions of how their lives are going. It calls for these measures to be collected on a regular, systematic basis and published as National Accounts of Wellbeing. The measures are needed because the economic indicators which governments currently rely on tell us little about the relative success or failure of countries in supporting a good life for their citizens. Download the report here or, for more information visit the New Economics Foundation website. 1. Good jobs: everyone should be able to find secure, stable employment that pays at least enough to provide a decent standard of living. 2. Wellbeing: improving people’s lives should be the ultimate aim of public policy, measured at headline level as average reported life satisfaction. 3. Environment: our prosperity and that of future generations depends on a healthy environment. UK carbon emissions must not exceed the set limit if we want to avoid dangerous climate change. 4. Fairness: high levels of inequality, evidenced by a growing gap between the incomes of the top and bottom 10% of households, have been proven to have corrosive effects on both society and economy. 5. Health: good quality healthcare and public health provision, measured by a reduced percentage of deaths considered avoidable, is a pre-requisite for all other social and economic goals.